Most important thing to decide what to learn..!! If you are reading this, that means you are thinking about learning a new programming language. It does not matter you are a beginner or an experienced one, it’s natural to think about your future career choices. Here are many ways to rank programming language. Despite all the factors like easy learning, the great performance we mainly focused on how much salary you can get after learning those languages. we can make this comparison on different factors but As the day’s end, we all want to earn money.But before discussing why we choose those programming languages further, here I want to put a short description why we need to learn a new programming language. If you are an Android Developer and interested in earning money you can check this. There I describe how much an Android developer can earn. Over the years, 300 programming languages have come into existence which Developers can learn. It’s not possible for any one to learn all those languages. As a result, there are lots of companies are searching for people with right skills so that they can maximize software stability and performance. As a sector, ICT is growing rapidly and creating about 120,000 new jobs each year. But due to differences in demands and skills, and despite high unemployment. Europe could face a shortage of up to 900,000 skilled ICT workers by 2020. Developers job come with its own challenge and need professional skills to survive. Due to outperforming supply and continues the growth of software development industry. There is a huge job opportunity is coming on software Industries in the year of 2020. As we can see it’s a great opportunity. 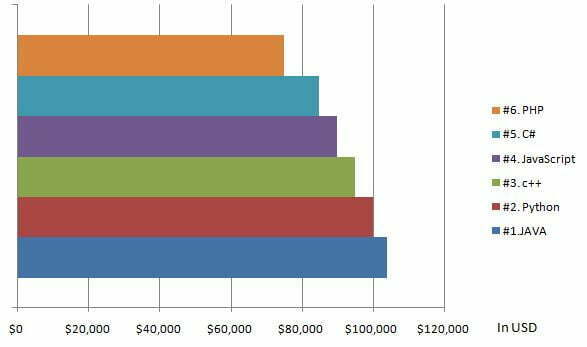 So, what kind programming languages you need to learn to survive in this always growing software market and most important get a maximum salary? To answer you this question we dig deep down, we pored through data from different job sites like Indeed, Glassdoor and Naukri.com for the number of the job posting in different programming language and their salary. 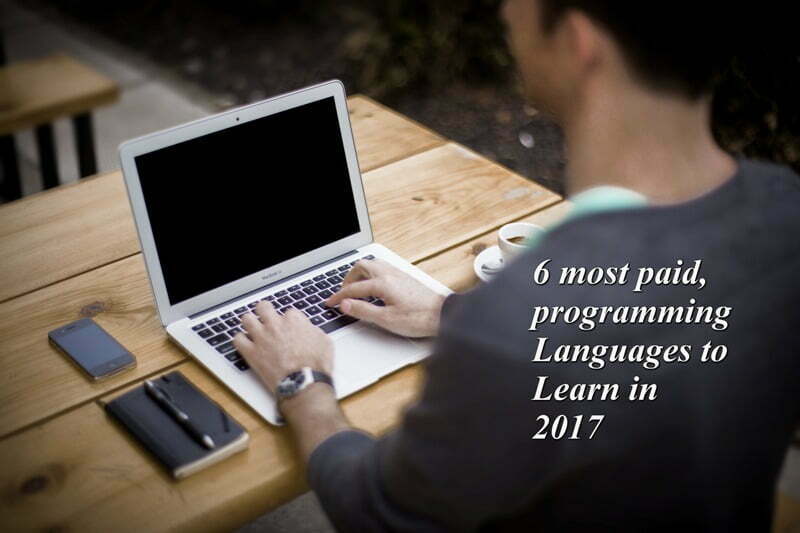 With all that information, we have compiled a list of six programming language which is paying most in 2017. PHP( Hypertext Pre-Processor) is a server-side programming language, which can be used to create web pages written in HTML. It’s used on most web pages we see around, like Facebook, WordPress. Worldwide around 7% software jobs are for PHP developers. PHP is ranked 6th in the TIOBE programming community index and has grown with 43% on GitHub. C# is a high level, an object-oriented programming language created by Microsoft. It has become popular among developers who developing Microsoft related apps. C# is also very crucial in developing games, many popular game engines like Unity support developing games with c#. c++ is a very powerful general-purpose programming language based on c language. It’s a must learn a programming language for a programmer who is dealing with system level development. It’s also a very high-performance programming language used to create operating systems, game engines and also used to write driver software. Python is a widely used modern programming language used for general purpose programming that’s extremely popular in the scientific field. It’s a versatile embedded scripting language, of many web frameworks, a preferred choice for automating tasks. Tech giants like Google and Yahoo along with NASA and Reddit use Python for deep learning frameworks. In 2016 Microsoft also launched Cognitive Toolkit which also includes support for Python. Java is the worldwide most popular language of all time. James Gosling and his team created JAVA in 1995 but even after 22nd-anniversary java does lose his glory. It’s a class-based OOP (Object Oriented Programming) language designed to be portable. Like its slogan “write-once, run anywhere“, Java is highly portable language, programs are written in Java can virtually run on any platform. This makes this language that much popular. The TIOBE ( The Importance Of Being Earnest ) programming community and PYPL (Popularity of Programming language) places java as no. 1 in this year. You can check TIOBE report here. Google recently announced Kotlin as official programming language along with c++ and java. Maybe this can impact Java’s android market, But there is no news about this yet. If you want to know more about Kotlin you can check my previous post start with Kotlin. You might too confuse about choosing a programming language, don’t worry about you may pick a troublesome technology, There are no wrong one. There are those that aren’t best suited to the specific project, But you only discover that only by trial and solving the error. Pick an interesting project, choose any language and start coding. Don’t always run after money. You may reach a point where someone will pay handsomely for your expertise but don’t depend on it. Being paid for developing is a bonus. if you don’t enjoy programming, suites will become a chore and no monetary reward will make you happy. So, which programming language you are learning this is me in comments? Right now i feel comfort with php and bit with js. Thanks for your comment, As per your choice i want to say, excellent choice Rohini php and js both are very popular nowadays. Feel free to play with them and make a good grip, one thing i can say if you have a good grip on them then a excellent job waiting for out there. I been looking for this for my friend and for my cousin as well. I just want you to update for 2018 as well. Very good informative post. Isnt Ruby on rails also pretty well paid? i know its loosing the popularity but still? Yeah ROR is paid well but not that much. It will be 8 or 9th position in my top earning list. According to the TIOBE Index proved the ROR is still relevant as well. In, February 2017 Ruby was ranked 11th. But it's totally 2017 result. I'm compiling a new report for 2018 it will be ready in few month. In that you will be able to see the clear picture of 2018 programming world.